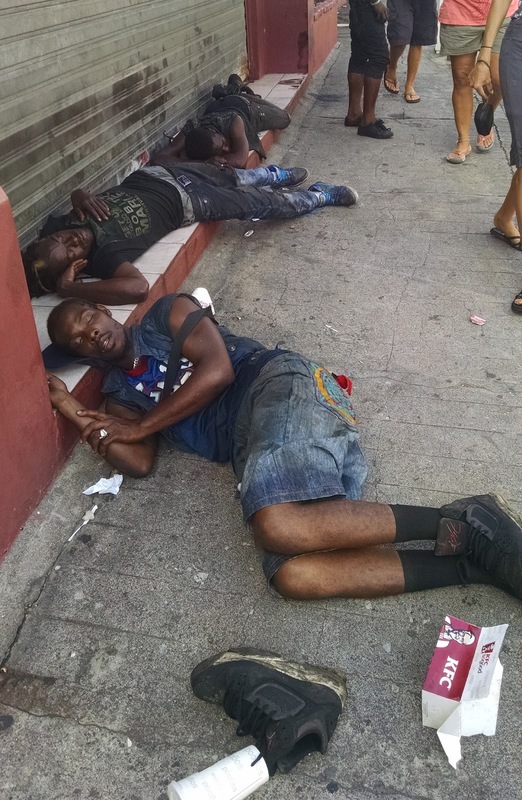 Have you ever wined with the Jab Jab at J'Ouvert or chipped to the blasting soca at the Fancy Mas? Well, we didn't go that far, but we did succumb to the call of the Carnival. Carnival is a long-standing tradition in the Caribbean that originated in Trinidad in the 1780s. Slaves who were banned from French masquerade balls started to hold their own mini-celebrations. 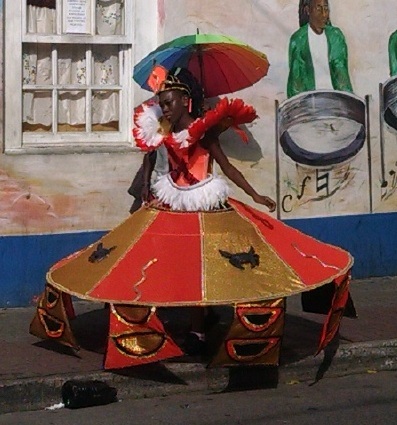 These small carnivals incorporated the slaves' own folklore and rituals, but also imitated or made fun of their master's masquerade balls. Over the years these parties transformed into festivals that include numerous parties, parades, and much, much debauchery. 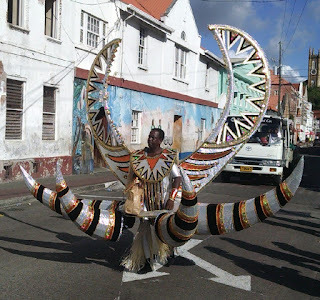 No longer associated with the period before Lent, the two-day celebrations of Carnival and J'Ouvert happen at a different time of year on each Caribbean island. 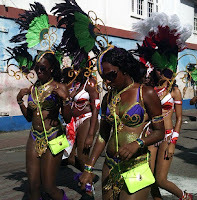 We arrived in Grenada in early August, just in time for their comparatively small Carnival. Mas: An abbreviation of the word masquerade. 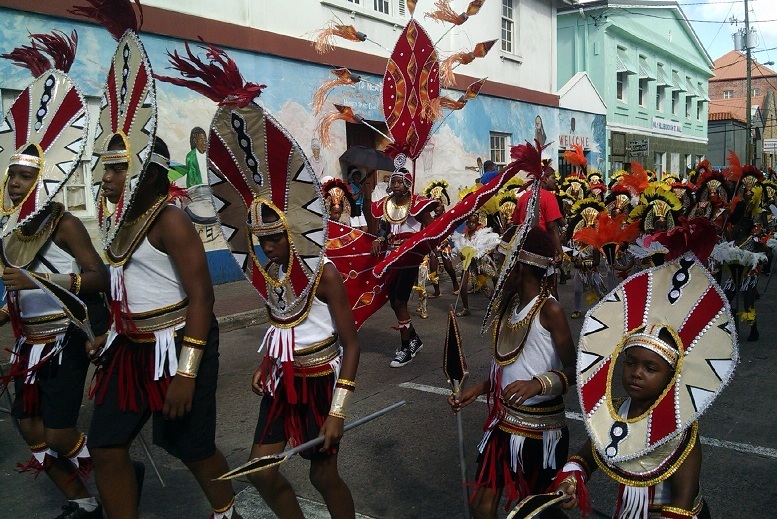 It is used to refer to various events within Carnival. 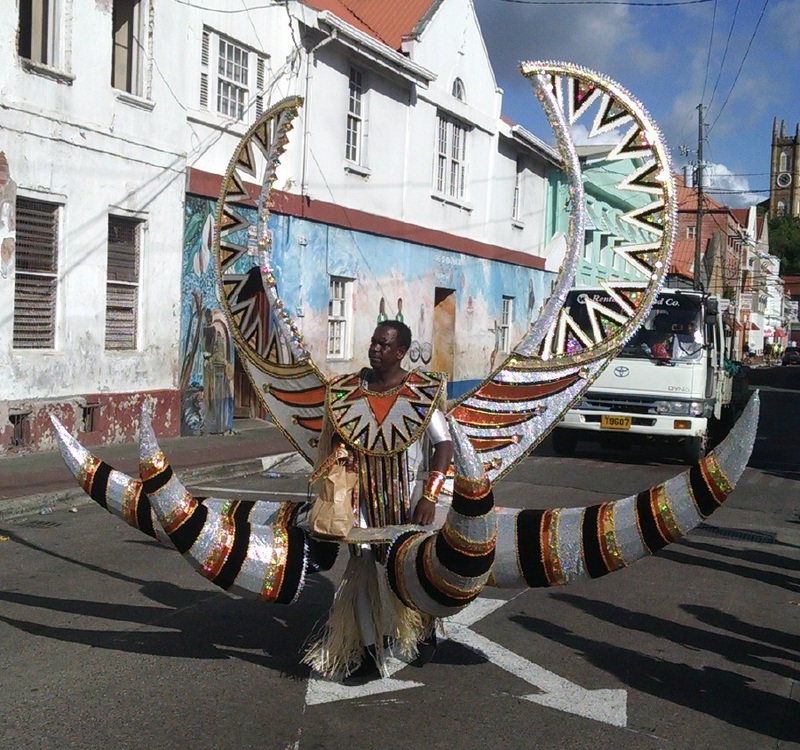 Monday Mas: The first official day of the carnival masquerade. J’ouvert: An early morning street party that occurs before carnival Monday celebrations. The name is a contraction of the French jour ouvert, or dawn. This celebration starts around 4AM and lasts until a few hours after dawn, getting fairly debauched. Numerous soca bands perform while party-goers wine (see below) and dance through the streets. 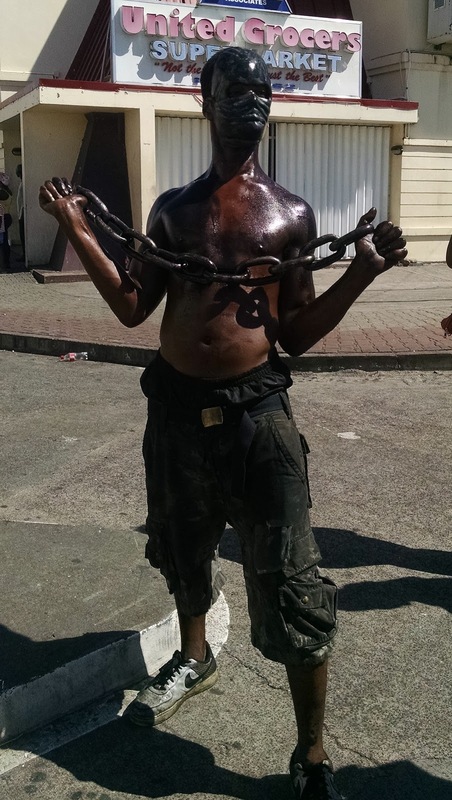 At J'Ouvert, participants are smeared or covered with mud, paint, used motor oil, or molasses. Those standing away from the bands are spared, and the locals usually ask tourist-looking folks for permission to cover them. 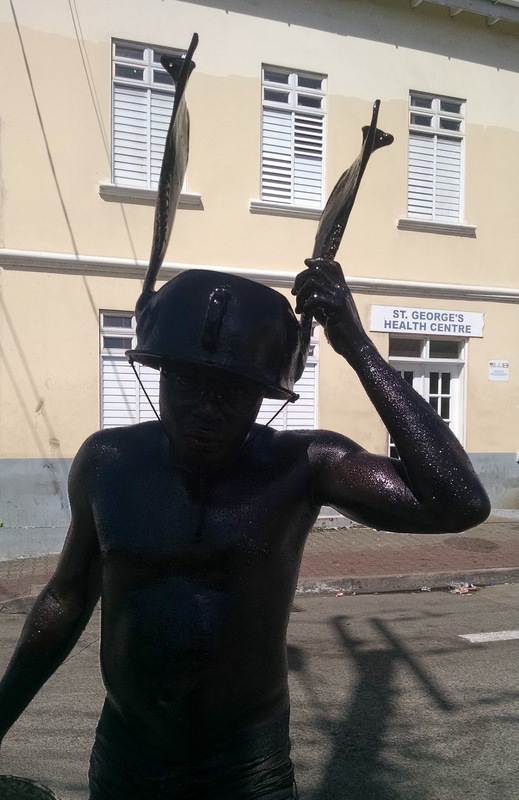 A common participant at J'Ouvert is the Jab Jab (see below). Fancy Mas: The Monday afternoon parade and subsequent stage show that involves participants in highly complex and colorful costumes. 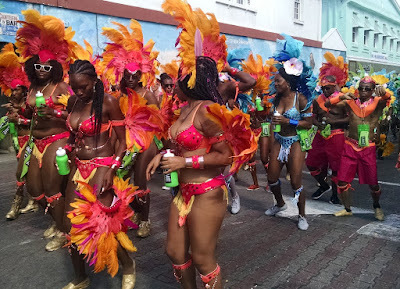 Ole Mas (Ol’ Mas): Used to distinguish the traditional mas variations that might have been found in the 1800s from the modern bikini and beads mas play that dominates today’s Carnival. 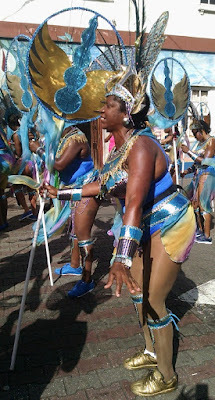 Jab Jab: A devil masquerader who often carries a whip and wears a horned head piece and a heart-shaped chest piece. 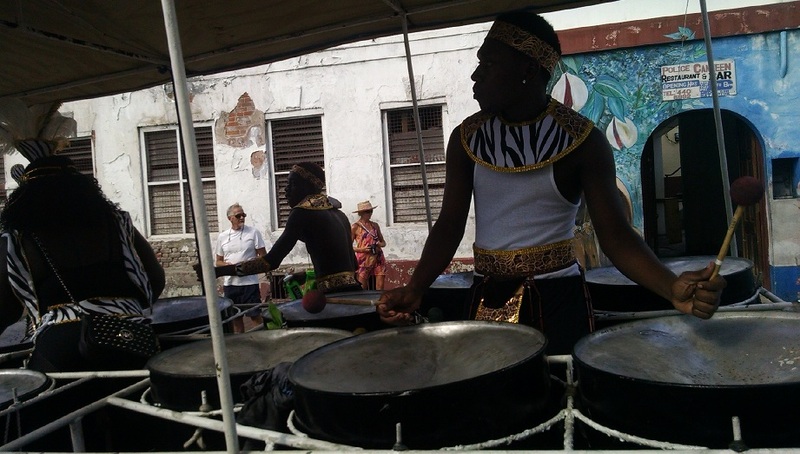 Soca: A type of music named for the contraction of "soul of calypso." The music is a combination of Calypso with electronic music, fused as a dance track and played heavily during Carnival Season and at fetes throughout the year. Wining: A style of highly sexualized dancing, not unlike twerking. 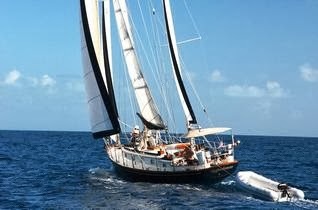 Soca is characterized by gyrations of the pelvis, isolation and control of hips, and partner contact. Similar to what would be considered grinding. Chipping: The act of rhythmically shuffling one's feet to the beat of Carnival music while in procession down the streets. 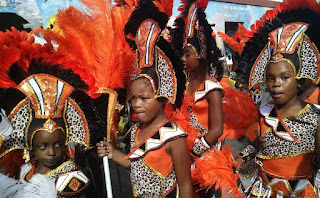 On Monday afternoon we packed into a bus and rode to St. Georges to watch the Fancy Mas parade. It was just too much and also far too little at the same time. Sure, it was a festive cultural event that we were glad to experience, but it left much to be desired in a lot of ways. 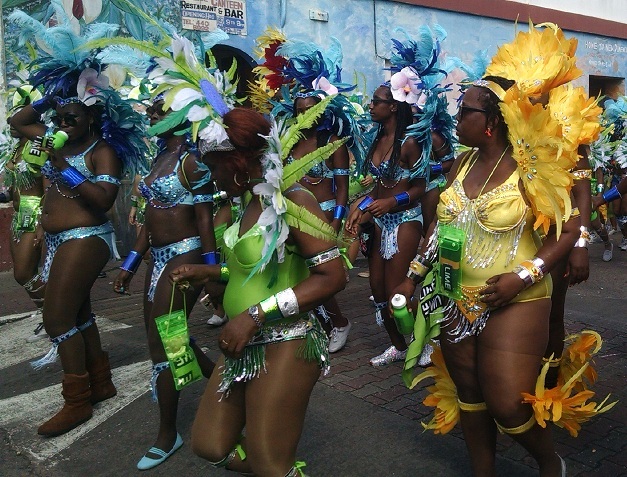 The costumes were amazing explosions of sparkles, bright feathers, and beads. 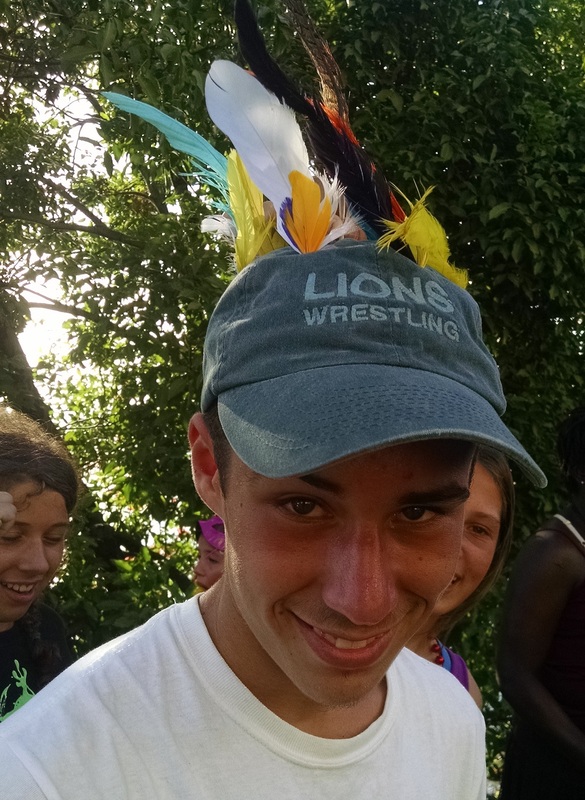 Many were tribal in flavor, and all were skimpy. 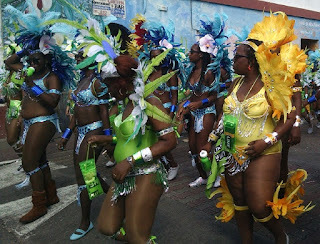 The free water bottles, scarves, and other swag given out phone companies Lime and Digicel and carried by participants detracted from the aesthetic of the costumes. 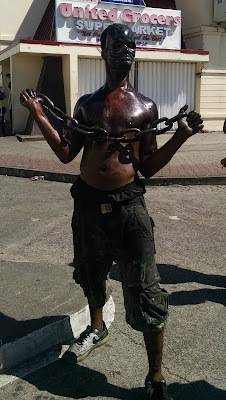 Even though this was the "family friendly" part of Carnival, there was too much flesh and too much shaking of that flesh. Yes, I sound like an old coot, but much of the "dancing" was unimaginative hip grinding and little else. Participants walk with a rhythmic shuffling called chipping. Some people infused their chipping with energy, but many looked more zombie-like than enthusiastic. Some looked just plain bored. We even saw one woman walking in the parade while eating chicken from a take-out box. Each different costumed group walked together, but little else added any sense of organization or structure. Hard to tell this was a parade, save for the fact that they were in the street. The end-of-parade stage show was equally unimpressive. Performers seemed to walk or skip all over the stage in random swarms. No actual choreography was discernible, and the constant wining got pretty old, pretty fast. I certainly value the existence of art within in culture, and am not suggesting that any time and effort spent on an aesthetic pursuit be forsaken for purely constructive purposed. But a part of me felt sickened by the excesses of the Carnival. The money and effort spent on all those costumes seem too much, given the state of education and low economic status of so many people here. And the excessive sexualization of the dancing was disgusting, especially since little else came along with it. 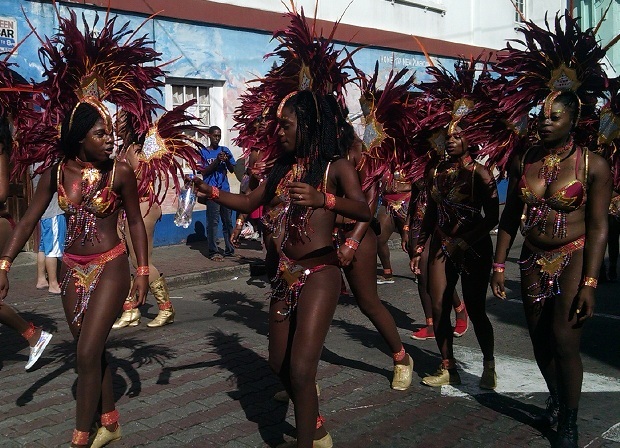 It was disturbing to see very young girls emulating their older peers and dancing in this way. While I am glad that we went to Carnival, it won't be tops on my list at every island we visit.